Can someone help identify these cars? Thought you all might have fun with these shots! These pictures are apparently taken at the same time, of my mother in law, her younger sister, and their parents. Both pictures are labelled “1949 Pontiac”. But, I don’t know if that is a reference to the date and location, or the vehicle make and model. I know Pa worked in Detroit around this time. He was too old to be drafted, but he found very lucrative work at the Naval Base in Alameda, California during WWII. And, he worked in GM plants in the Detroit area too, before returning to our mid-Atlantic home base in the early 1950’s. My mother in law’s parents and her younger sister are all deceased, and my mother in law doesn’t remember this setting. I wonder if the caption is really meant to be “Pontiac, Michigan, 1949” but the makes and models of the cars shown might help deduce that. I think 1949 for the date of the shot is about right based upon the sizes of the children. I would suspect the note on the pix is Pontiac, Michigan, judging by the snow. As it happens, I have a family car in snow pic too. Thing about winter pix in Michigan, the sky and ground are often the same color, so it’s difficult to pick out where the snow ends and the sky starts. From the vantage point of being Homo sapiens, it almost seems like we’re looking at Homo erectus. I get as far as Mercury, Ford, Mopar (Plymouth or Dodge). Years to follow . . . The cars in the left and middle are 1946 – 1948 Fords or Mercury’s. The car on the right is from the late 30’s. There is no 1949 Pontiac in the picture. 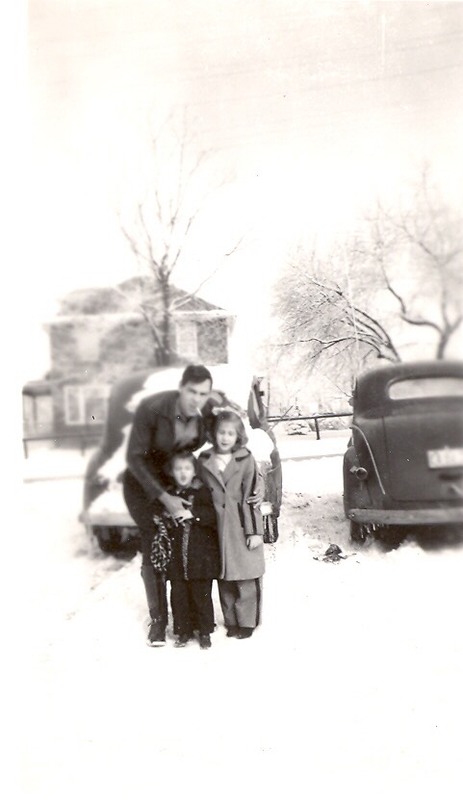 Likely they were taken in Pontiac,MI in 1949. 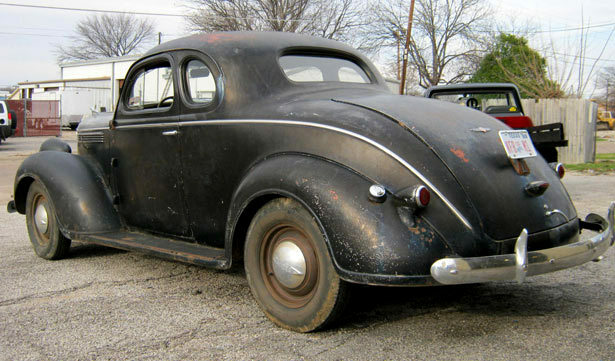 Yeah, 48 Ford/Merc was my guess too. Well, at least the one on the left. Not at all sure about the others. I would think the car on the left is a 1947 Ford – the Volvo PV544 is a 5/8 copy of its style! The others? I have no clue. Exactly right on the Volvo! And I always thought the 122 Volvo–at least from the rear–was a pretty good copy of a ’52ish Chevrolet. Funny story in my family about the PV544. In the early 60’s while vacationing in Ontario Canada, My father saw several PV544 Volvos and was enamored by the 47 Ford style. We lived in rural western Pa., and had not seen any in our area before. Got home,my father found a dealer in Pittsburgh and checked them out. Almost had a stroke when he was told the price! Can’t find the MSRP, but believe it was pretty high. More than most American Base cars at the time. Guess he thought since it looked like late 40’s Ford, it should have been priced like a late 40’s Ford! And I figured I’d be the only one who thought of the 544 as soon as I saw the back end of the old Ford. As always, I under-estimated how CC’ers minds work! 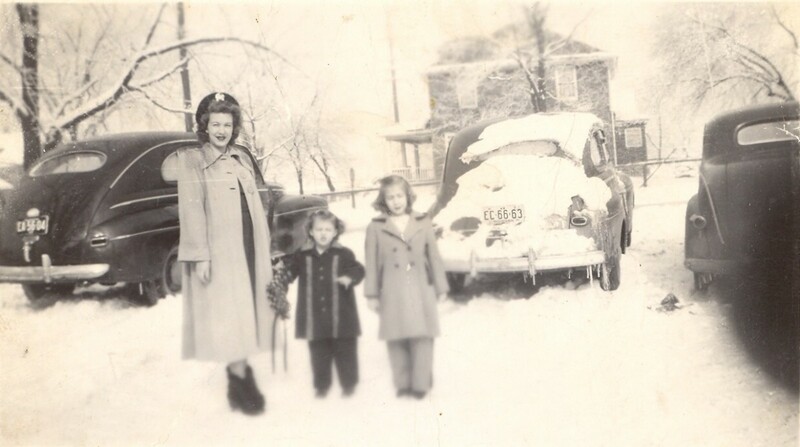 I think we have a picture of our family 544 in the snow somewhere, perhaps the only time it saw snow in the 4 years w e owned it. Working on Mr. Ritchings ideas, I agree that the car on the left appears to match a ’41 Mercury sedan. For the middle car, the spacing of the bumper guards and horizontal tail-lights seem to make it a ’46 Ford. Good detective work. I, too, am lost on the car on the right. It appears to be a business coupe, but which manufacturer is beyond me. I have not had tine to respond to the essay on the Fifth Avenue Coach buses. I will be brief. The buses built for Fifth Avenue Coach (New York City) by General Motors were equipped with AUTOMATIC TRANSMISSIONS. One of our communicants remarked about driving those double deckers or single level buses with a crash box up and down Fifth Avenue. The transit company for Chicago also owned Fifth Avenue Coach. He learned of the revolutionary automatic transmission that was invented by Oscar Banker (born Asadour Sarafian in Moonjoosun, Turkey of Armenian heritage). The first one was installed in a 1926 Nash limousine and the improved model was installed in a 1928 Nash limousine in 1928. Despite the objections of the plant manager in Pontiac, Michigan to installing automatics, Chicago Trasit decleared that they would not place their order for five-hundred buses unless they were equipped with Oscar Banker’s automatic. Oscar Banker worked at the bus plant for several years in conjunction with GM. He was admonished harshly by the plant manager that if the automatic transmissions failed before 250,000 miles (got that?) that Mr. Banker would be responsible for the expense to repair them. In Mr. Banker’s autobiography he notes that none of the transmissions failed. The buses in your article are reported to have been in service as late as 1953 while Mr. Banker reports 1955. His automatic transmission still stands as a remarkable achievement and is the basis for most automatic transmission designs used today save the DAF CVT and the now not used Dynaflow. Thomas, you’re right that the Yellow Coach models 720 and 735 double deckers did not have crash boxes. What the had were the Banks “Mono-drive” semi-automatic transmission. It’s an interesting unit, but ultimately was not successful. It utilized a centrifugal mechanical clutch, and planetary gearsets, but was not fully automatic, as the driver had to lift up the throttle pedal to instigate a shift. It also was not very reliable in the brutal use, and by 1938, was replaced by the much more robust Spicer torque converter unit that ended up being used by GM transit buses (and later others) for decades. Also introduced on the Model 720 and 735 was the Banker “Mono-Drive” semi-automatic, a mechanical transmission licensed from Oscar H. Banker, an Armenian-born engineer living in Chicago. Also available on the 718 series coaches, the Mono-Drive ultimately proved unreliable in constant use and was replaced in 1938 by a more robust Spicer Mfg. Co. built hydraulic unit that had been developed in conjunction with Yellow Truck & Coach’s engineers. Some have claimed that Banker’s transmission was copied for the GM Hydramatic (not the Spicer as used in buses), but there’s a number of significant differences too. Undoubtedly the GM engineers developing the HM were aware of Banker’s work, but did not license his patents and went their own way, despite Banker having originally developed the Monodrive with Yellow Coach engineer’s involvement. Yellow was already a GM subsidiary at the time. But as I said above, these multi-speed automatics were not ideal for transit use, and the Spicer unit used just a torque converter and a lock-up clutch, so it was essentially a one-speed unit with direct drive once it was locked up. Anyone riding transit buses in the 50s,through the 80s (or later) will remember the experience of riding in a Spicer-equipped bus, with its abrupt shift (jerk) into direct gear. I agree with several others here. I get a 41 Mercury, a Ford that could be 42-47 and a 38 Dodge coupe. I believe the one on the left is a 1941 Mercury tudor sedan. The one in the middle is a 1942-1948 Ford tudor sedan, and the one on the right is a 1936-1938 Plymouth possibly Dodge coupe. Whatever those cars were, I wonder if they’ d start? 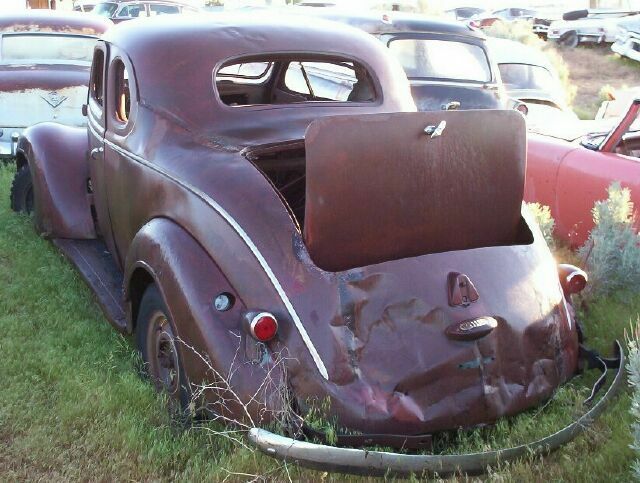 I had a 1946 Ford coupe I used as a daily driver back in the ’80s. It always started with a slow growl in the coldest NY winter weather even on it’s 6 volt system. …and the license plates are Michigan. I don’t see anything that even resembles a ’49 Pontiac in those pics. (I drove a ’50 Pontiac). I think it’s likely referring to the location. 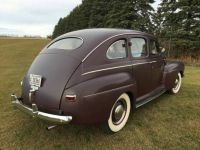 Looks like the Mercury on the left, and probably the Dodge on the right have 1949 Michigan plates, while the Ford in the middle still has a ’48 Michigan plate. In those days I believe everyone got new plates in the first couple of months of the year (currently it is based on your birthday) so this is pretty early in 1949, which would make sense with the snow. The license plates are Michigan 49 and 50. 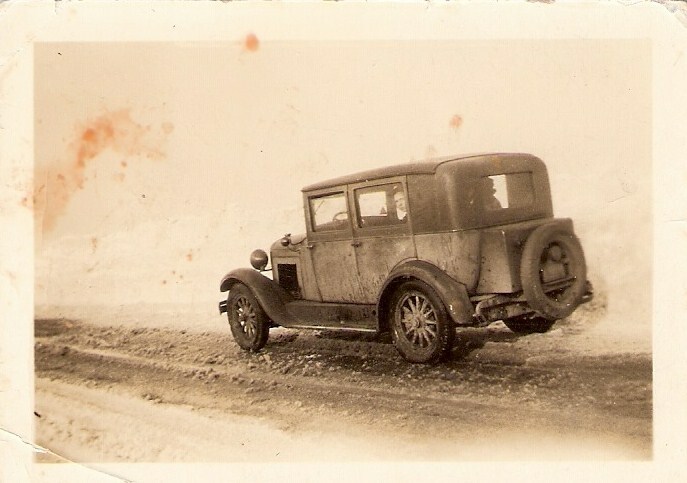 The photo must have been taken in January or February 1950 during license plate changeover time. Left, 1941 Mercury; center, 1946 Ford. Right, 1937 or 38 Chrysler product, probably Plymouth.